David Booth is a marine ecologist, especially interested in the role that processes around the time of settlement in reef fishes influence population dynamics, and how anthropogenic pollutants affect estuarine fishes. Recently, he has turned his attention to the role of marine protected areas in enhancing biodiversity and sustainable fisheries opportunities, including development of the National Statement on Marine Protected Areas (opens an external site) by the Australian Marine Sciences Association and the Australian Coral Reef Society. He is currently researching deep sea fish ecology as part of the global SERPENT project (opens an external site) using ROVs attached to oil rigs. 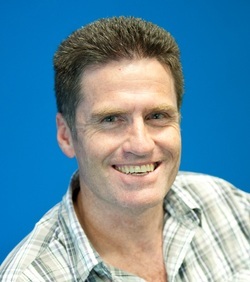 David is Professor of Marine Ecology, leading the Fish Ecology Lab, is Director of the UTS Centre for Environmental Sustainability (CEnS), and has been at UTS since 1994. Previously he was an ARC Postdoctoral Fellow at the Australian Institute of Marine Science and a Visiting Professor at the University of the Virgin Islands. He has an active postdoctoral and graduate student group, and is Chair of the Scientific Advisory Committee of the Sydney Institute of Marine Sciences (SIMS) (opens an external site). He currently collaborates with NSW Department of Primary Industry, NSW Dept of Environment and Conservation,, UTS Microstructural Analysis Unit, Oregon State University, the Russian Academy of Sciences and the University of the Virgin Islands.